For a time, we had considered sparing ourselves the Revenge of the Fallen toy line, but now I shall witness...it's dismemberment! 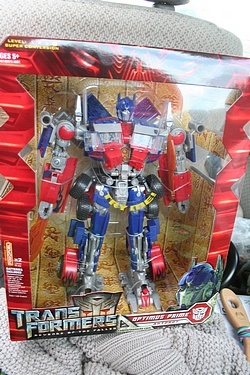 Well, at least, I shall witness what was said to be the crown jewel of the new line by the Hasbro team themselves, the brand new Leader Class Optimus Prime! We saw it in the stores, along with the first wave of the new Deluxe, Scout and Voyager figures and simply could not resist! As is the case with the Pandora's Purchase around here at the Preserve, I have to imagine that we'll be seeing at least a few more figures from this new movie line posted to the archives soon. In the meantime, click the image below to see our gallery of this new figure, taken in the back of the car in the Target parking lot in our haste!